Thank you so much for hosting our wedding at Evergreen Gardens on July 17! Your grounds are so beautiful and using your decorations we were able to get so many beautiful pictures! Thank you for being so helpful the day of the wedding. You made our set up and transitions run so much smoother. Also, thank you for making the planning process easy. This was something we were worried about as we are from out of state. Thank you again! The moment we drove up the driveway to Evergreen Gardens, I knew this was the place I wanted to get married. I fell in love with the towering trees and beautiful landscaping. Everything was there for our use – tables, chairs, even the shepherds hooks I wanted down the aisle! I was extremely pleased with how our wedding turned out! We loved having our wedding at Evergreen Gardens. Ray and Patti were extremely helpful and their gardens and lawn were immaculate. When the weather threatened to have us undercover, they helped accommodate everything we wanted to do and helped still make it happen! We loved the facilities and couldn’t have been happier with how the day went. Our guests also loved the fire pit and making s’mores and couldn’t stop talking about how pretty everything was! Evergreen Gardens provided the perfect venue for our wedding. The gardens and covered reception are absolutely gorgeous. After looking at several potential wedding locations, I knew where I wanted to have our special day as soon as I saw it. Patti was wonderful to work with and she had a lot of good and helpful input. Evergreen Gardens was the best wedding decision, besides my husband, of course! Evergreen Gardens is one of the most beautiful event properties in the pacific northwest. The grounds are impeccable. From the manicured lawns to the sculptures and gardens the attention to detail is flawless. There are several different areas to choose from to have your ceremony in. Each area is wonderful. Our daughter chose to have hers under the towering evergreens. It was a woodland wonderland. The dining facility is beautiful and accommodated our large group very well. The facilities, restrooms, brides and grooms rooms, catering areas are all top of the line, clean and like brand new. The grounds and gardens are extensive and our guests enjoyed walking around looking at all the beautiful flowers and trees. Patti was so wonderful. She answered any questions and was very helpful with recommendations of caterers, florists, etc. As a result our daughters wedding was perfect and the event ran smoothly from start to finish. Thank you for a such a memorable wonderful day! When searching for the perfect wedding venue my daughter and I visited Evergreen Gardens. After walking through the serene grounds, my daughter said “This is what I imagined”, our search was over. The wedding ceremony took place in the North garden, the reception moved to their grand outdoor hall. We had a blazing fire for S’mores – this was a hit with guests. Patti Johnson was very gracious and helpful, all of her recommendations where spot on. My daughters wedding at Evergreen Gardens was her dream come true. Our day could not have been more perfect. Patty and her husband Ray have poured their heart and soul into the grounds and facilities and it shows. Kelli and I could not have been more pleased. Patti is great to work with as well. It was important for her that we incorporated our own ideas but she was always there to offer guidance when needed. 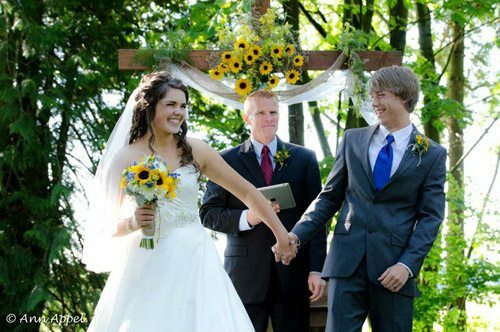 We would be the first to recommend Evergreen Gardens to the next lucky couple. Evergreen Gardens created a magical atmosphere; it’s lush grounds meshed perfectly with the gorgeous buildings to create the perfect back drop for our wedding and reception. We had multiple people comment on how much they loved the venue, which made our day even more special knowing that everyone was having a good time. It was nice to have the owners, Patti and Ray, on site. They made the whole day run smoothly. We are so happy we found Evergreen Gardens, we could not have imagined having our wedding anywhere else. Evergreen Gardens was the most beautiful place I ever could’ve imagined getting married at; the day my fiance and I first viewed it, we had several other venue viewing appointments lined up. As soon as we walked through the beautiful landscaping, we immediately cancelled our other appointments and booked Evergreen Gardens. Patti and her husband were extremely helpful every step of the way, making the wedding day wonderful, easy and fun. Kind, helpful owners, and immensely beautiful scenery – you really can’t go wrong with Evergreen Gardens. Evergreen Gardens is where my Country Fairy Tale came true. The lush gardens and peaceful cedar trees made the perfect rustic romantic setting for our wedding. My favorite part of having our wedding at Evergreen Gardens was its laid back atmosphere with its sophisticate flare that made our wedding fun and enjoyable for not only us but all our guests – it was truly a great celebration. Evergreen Gardens is a reflection of its owners; Ray and Patti are as wonderful as their venue as they were great to work with. Thank you so much for providing such an idyllic setting for our wedding last summer on August 18th! The grounds are so beautiful and we never could have dreamed our wedding day would be so perfect. We really appreciated the special attention you gave our guests by bringing out your patio heaters and providing blankets as it got more chilly. We also appreciated the use of the television so Randy and Cathy Fleming could display some of the photos of the day. It was such a pleasure to work with you both! Evergreen Gardens has more than just beautiful surroundings to offer. Not only do you get to choose from a variety of settings to get married in, but you also get the unique use of their campfire, a large covered area in case of rain, heaters and blankets, and beautifully appointed dressing rooms and bathrooms. Patti and Ray are there to help out if you need anything and are very nice people to deal with. You will not be disappointed with this venue. My guests were gushing with how beautiful and unique it was! Thank you Ray and Patti for your labors of love in providing such a gorgeous venue and for being such gracious, kind and helpful owners that share this “Heaven on Earth” with so many brides, grooms and families. We had a great experience at Evergreen Gardens! Both Ray and Patti were very accommodating to us. The venue was beautiful, and we received many compliments on the beauty of this location. We have never been happier than we were on our special day and Evergreen Gardens helped to make that happen. Thank you for a wonderful experience!!! Since my son lives in Japan, I was asked to find a special outdoor venue to host his wedding. I found a gem of a place! Evergreen Gardens. The grounds are quiet, natural and spacious, with tall evergreens and well groomed gardens. It was perfect for our intimate gathering of family and friends. Patti Johnson was supportive and helpful, and always there if I had a question or concern. I appreciated the links she provides on her website and was very pleased with the ones I chose. Thank you Ray and Patti for sharing your first class venue with us. Ray and Patti, we can’t thank you enough for providing such a beautiful venue for Jessi and Martin’s special day. Your guidance/suggestions for set-up were very much appreciated as was your assistance in breaking down tables and chairs at the conclusion of our event. The fireside seating for our guests to relax and enjoy the evening created a magical touch. What can I say, it truly was the perfect day. My wife and I were so blessed to be able to get married at Evergreen Gardens! From the first time we walked through the venue to the moment we drove away after the wedding Ray and Patti made our special day even more amazing than we had hoped for. Evergreen Gardens is truly a little slice of heaven in Whatcom County! Thank you Ray and Patti so much for your service to us on Kalynda and Ryan’s wedding day. You helped make it the “most special day of their lives”. From the time that God gave us August 25th on your calendar, we were looking forward to being at your beautiful gardens and we were blessed by its beauty on Saturday. We know how much hard work you do to make it that way. Thank you! Ray and Patti, we just wanted to thank you for making the venue for Joey and Micaiah’s wedding such a wonderful place! It is very evident that you put a lot of love into your gardens and the most wonderful thing about that, is that it carries over into your relationship with the people (like us) that you come in contact with. Thank you for your help and loan out of such beautiful decorations as well. We can’t say enough about Evergreen Gardens and you! Beautiful! It must be wonderful to know that what you do brings such joy and special memories to so many people. Keep up the great work! After arriving at Evergreen Gardens, I knew that my search for the perfect venue was over!! The grounds were immaculate and pristine. Walking the grounds was a visual treat with towering green trees, landscaped gardens and a serene tranquility. I loved all the added extras such as a fire pit where we had our s’more bar, the bench tucked away underneath the trees just waiting to be escaped to, and the outdoor reception area where we could dance the night away. Both Patti and Ray went above and beyond to offer their help and assistance leading up to our wedding as well as on the day of, making sure things were running smoothly and offering to help where it was needed. Not one guest walked away from our wedding without commenting on what a beautiful place Evergreen Gardens was, and we feel the same! Evergreen Gardens was instrumental in making our wedding dreams come true! Thank you so much for allowing us to have our wedding at your venue. Your place is so beautiful and I was able to have everything I had ever hoped for. I appreciate all of your help in terms of sorting out details and meeting with us several times before the event. Many of our guests commented that your grounds were “gorgeous” and “perfect” like nothing they had ever seen before. They said it was the most beautiful wedding venue they had ever seen and they were right! Thank you once again. Evergreen Gardens was the perfect venue for our wedding. It was truly magical! There are a thousand little details that Patti and Ray have put into Evergreen Gardens, from the fresh blooming flowers, the s’more pit, the pavilion and bar, to the lanterns, signs, centerpiece items, etc. that are available. We would highly recommend Evergreen Gardens to anyone looking for an outdoor venue; this place has everything and more! Thank you so much for all you did for our wedding. We loved the venue! It was truly the perfect spot for our wedding and such an incredible backdrop for our celebration of God’s faithfulness. Our guests loved being there and we got many compliments. We loved having a huge part of our decorating being God’s natural beauty (and your hard work). You were so easy to work with and we had a great day, the best day of our lives. Thanks! Thank you both for letting us use your beautiful place for our wedding! I couldn’t have asked for a more perfect day. You have been so accommodating and helpful! We really appreciate all the hard work you put into your home! Thanks! Thank you very much for letting us use your property for our wedding! We had an amazing day and we appreciate all the work you did to help set up and make the grounds so beautiful. What a joy it is to receive your kindness and get to know you! God’s blessings to you both!